Most of us assume that while relativity is certainly true it's both more strange and more complicated than we can possibly understand and not especially relevant in our day to day lives. Beyond that, we might consider pictures of Einstein with his tongue sticking as cheesy yet amusing, but the details of his theories we tend to put in the Things I don't Need to Worry about Right Now bin along with How my Microwave Works and What is my Spleen For? 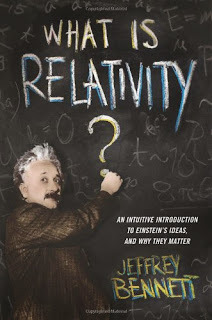 Jeffrey Bennett's What is Relativity? (public library) makes Einstein's major theories both understandable and relevant. He makes it clear by building up the stories slowly, first introducing concepts that go down fairly easily, like how measures of speed depend on your point of view. For instance, a plane can appear, from the ground, to be flying at several hundred miles an hour, but the same plane, when viewed from the moon, can look perfectly stationary while the earth travels at several hundred miles an hour beneath it. To these concepts he adds the fact that the maximum speed of light in a vacuum is always the same (around 300,000 meters per second), no matter what your point of view is. This constant speed of light means that when you start travelling at speeds close to the speed of light, not only do things like speed become relative depending on your point of view, so do things like length, mass and time. That's where all the weirdness comes in, like space voyages taking hundreds of years to people on Earth but only decades in the spacecraft, or objects freezing in time at the edge of black hole. Bennett dives into all of this, but gently explains it, illustrates it with examples and cute drawings and finally gets you to a place where you are nodding and thinking, "yeah, that actually makes sense." Oh, and in under two hundred pages. And with almost no math (the little math he does use is drop dead simple). But Bennett doesn't leave it at that. He gets that you might have trouble accepting the conclusions of relativity even after you understand them. He helps you with that too. You once thought, for example, that up and down were absolute directions. But when you learned about the earth being a sphere and that people in Australia where upside down relative to you, but upside up according to themselves, you adjusted and your brain didn't fry. You can accept relativity in the same way, and without frying your brain. Finally, should you think all of this irrelevant because you personally can't travel at near the speed of light and probably will never spend a vacation at the edge of a black hole, Bennett provides lots of examples of where relativity is used in daily life in places as mundane as the GPS function on your phone. It's enough to open up your mind to many possibilities, but in a scientific way, in a way that will let you consider the possibility of nearly anything, provided that it comes with evidence and explanation. Pretty cool.